Your one stop source for local, regional, and national fleet vehicle graphics! If your business regularly hits the streets in multiple vehicles, why not make the most of your mobility with a fleet of vehicle wraps? These billboards on wheels are high impact mobile marketing techniques, proven to increase brand awareness. Who benefits from a fleet wrap? How many vehicles are there in a fleet? Studies show, the vehicle wrap offers the lowest cost per impression over any other advertising medium. With proper care, a vehicle wrap can last for about five years. When you consider the cost of your wrap stretched out over time, it averages to thousands of advertising impressions daily. That’s just a few dollars a day! According to 3M (a prominent tape and vinyl substrate provider) a company would need to spend $130,000 in advertising dollars to produce the same effects of a $3,500 vehicle wrap. Studies effectively show vehicle graphics make name recognition more than 15 times greater. How many vehicles are in a fleet? At Sunrise Signs any two or more vehicles wrapped with similar branding qualifies as a ‘fleet’ wrap. Many companies assemble their fleets over time, so while your delivery business may have four Chevy vans, they could be entirely different years, makes or models. No problem! Our designers will create the correct templates to assure that all of your graphics fall into place perfectly, no matter the vehicle. If your company is interested in uniting a variety of types of vehicles through cohesive branding, we can work to create design elements that will look just right on either your box truck or your Smart Car. We offer three varieties of design coverage; full wraps, partial wraps, and custom decals and lettering. A full wrap involves bumper to bumper vinyl. Typically, full wraps are great if you're looking to showcase large graphics, tie several photographic images together or give your vehicles a fun pattern. Partial wraps are popular choices for fleets since they use less material than full wraps, which can keep costs down. Further, the partial wrap can sometimes translate to larger vehicles in a more creative way than the full wrap. A partial wrap still allows for big, bold graphics, but usually only on the sides or back of a vehicle. Custom decals and lettering is a good option for companies who only want to convey basic information on their vehicles, such as the name or logo. Some simple contact information like a web address or phone number might also be included. We are happy to coordinate with your designer, ad agency, leasing company, or OEM, on every aspect of your project. How much fleet down time will I have while the wraps are being done? Will there be a loss of productivity? 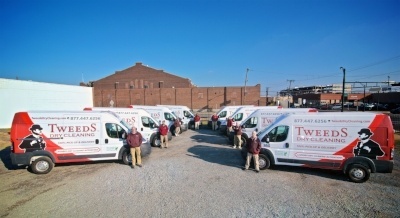 Our team will work with you to schedule your wrap installation to minimize vehicle down time. Whether you want to stretch out the installation period over several weeks, one truck or van at a time, or simply get as many vehicles wrapped as quickly as possible. I have a large nationwide fleet, how can I be certain that every vehicle will look like the others? Because all of your graphics will be printed at our facility, we will personally be supervising important elements like your color consistency. We also only work with installers who have been 3M certified to ensure the best possible finished product for you. My fleet is made of many different types of vehicles, can you accommodate that? We have experience designing vehicle wraps for everything from buses, to ice cream carts. We can create print and install wraps for everything in your fleet! My business is always growing, how do I know what quantity of fleet to plan for? Because we have your graphics on file, we can always print more at any time. We're also happy to hold on to graphics and install as each new vehicle is purchased. What if I want to change my graphics? Vehicle wraps are 100% removable. If your corporate branding changes, or if you simply want to offer a different promotion, just let us know and we'll get started on your new designs right away! Sunrise Signs is dedicated to creating quality products and satisfied customers. We offer a creative and knowledgeable design staff, premium materials, certified professional installation, and unparalleled customer service. We take pride in asking lots of questions to make sure that you're happy with your long term marketing investment. Everything from designing to printing and installation can be done on site in our Philadelphia area location, or you can take advantage of our national network of installation experts from anywhere in the country! Feel free to keep browsing our website for more pictures, videos, and articles about vehicle wraps. Get started on your own fleet right now by clicking the button below!